It can be tough to get kids to eat more fruits and vegetables, especially the vegetables. Read on for 10 tips you can use every day to help you encourage your kids to eat more vegetables! Kids really don’t need to eat all that many vegetables. Kids under 3 years old only need 1 cup of veggies every day; kids between 4-8 years old need 1.5 cups. But if your child isn’t interested in eating any vegetables at all, it can seem like every meal is a big fight. 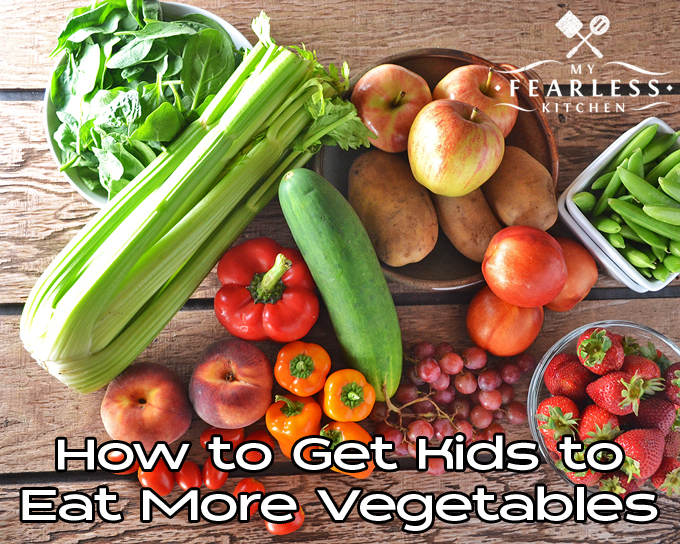 Check out these tips to help get your kids to eat more vegetables. Let your kids help out in the kitchen, once they are old enough. They are more likely to at least try different foods if they had help cooking it. My toddler was super-excited about helping me make banana bread the other day. I set him up with some bananas in a big bowl and our potato masher, and he went to town! That was some of the best banana bread we’ve ever had. Make it an activity, instead of just a meal. Kids like to play with their food. So give them something to play with! Give them strips of veggies – like bell pepper strips, carrot sticks, or celery sticks and something to dip the vegetables in. Think about dipping sauces like ranch dressing, yogurt, or hummus. Let them dip, spread, “paint,” and experiment. Even if they mainly use the vegetables as a spoon for the dip, as long as they are eating some of the veggies, you’re winning! Puree veggies and mix them into pasta sauce. Choose orange veggies (like carrots, butternut squash, or pumpkin) in cheesy pasta dishes; use any veggies for pasta with red sauces. Making your own sauce (or doctoring up a pre-made sauce)? Add in diced vegetables like onions, zucchini, squash, carrots, bell peppers, or tomatoes to the sauce as it’s heating. If you’re not a fan of chunky sauce, puree the vegetables first and then mix into the sauce. Add extra vegetables to soups, stews, and chili. If the recipe calls for 1 cup of chopped carrots in the chicken soup, double it to 2 cups. Thicken up chilis by adding in pureed pumpkin or squash. Use tomato juice instead of beef broth as the base for your vegetable soups. You can also add extra vegetables to canned soups! Add beans to ground meats. Beans are a great way to “stretch” ground beef, and it adds a vegetable! Instead of using 2 pounds of ground beef, use 1 pound of meat plus 1-2 cans of drained, rinsed beans. You choose – black, pinto, kidney – there are so many! This works great for almost any recipe that uses ground beef. Try a smoothie. There are lots of smoothie recipes available online. Do some browsing, then give a few a try. Smoothies are an easy way to incorporate fruits and dairy (think yogurt as your base). But you can also add in some vegetables, or even uncooked oats for a whole grain serving. Try serving up vegetables in different shapes. Think about baked sweet potato fries, or use a spiral-cutter to make vegetables into ribbons and spaghetti. You could also use cookie cutters for even more fun shapes. Bake or roast the vegetables in the oven, or steam them. Experiment with different toppings for vegetables. Try butter and seasoned salt; a sprinkle of Parmesan cheese; top with a tablespoon of shredded Cheddar or Mozzarella cheese; use ranch dressing, hummus, or even ketchup; try cracker crumbs for a fun crunch. Try different flavors and combinations and see what your family likes best. Try to incorporate more vegetables and fruits into every meal. Don’t be afraid to try new things – fruits or vegetables you haven’t tried before, a new preparation method or recipe. Mashed potatoes aren’t going over well? Try baked French fries or roasted potatoes instead. Carrot sticks a no-go? Try steamed carrot slices or baby carrots with butter and brown sugar. Experiment until you find something that works! Hiding vegetables may seem like an easy way to ditch the fighting at meal times. “Eat 3 more bites of broccoli before you leave the table!” is not how anyone wants to spend their evenings. But hiding veggies shouldn’t be the only way you encourage your kids (or your spouse) to eat more of them. If the only way your kids get vegetables is pureed in a sauce or hidden inside something, they will never “learn” to like them. So keep trying! By all means, add vegetables into the mac & cheese, but also offer some vegetables that actually look like vegetables. It can take children trying a new food up to 12 times before they actually decide if they like it or not. So even though he spit out the avocado tonight, he might decide he loves them at your next taco night! Change up flavors, textures, and recipes, and you’ll land on a few that your family enjoys. Looking for more recipes to try? Check out this post for some recipes that include tons of veggies. Remember, you’ll have to set an example, too. Your kids probably won’t be jumping at the chance to eat their peas if you’re not eating any. Top those peas with some butter, seasoned salt, or even a cheese sauce and show your kids how yummy vegetables can be.